Welcome to Pond Valley Labradors. 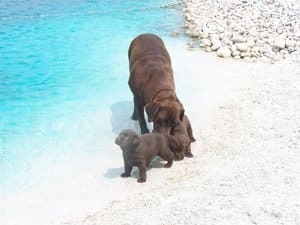 Located in Northwest Ohio, we have been Ohio Labrador Retriever breeders since 2000. All puppies from our adult Labrador Retrievers are family raised in a quiet rural setting on five acres with a pond. All of our puppies are sold with limited registration. Because we at Pond Valley Labradors love Labrador Retrievers, our goal is simple. We produce healthy, good tempered Labrador Retrievers that meet the AKC standard and that make great family pets. Then we make sure each and every one of our Labrador puppies finds a loving home. Because our Labs’ hips and elbows are certified through OFA (Orthopedic Foundation for Animals), you can be assured that you are getting a great addition to your family.